My early summer trip took me through Washington’s Tri-Cities to northern Montana on the way to Glacier National Park: werewolf territory according to Patricia Briggs‘ Mercy Thompson series. 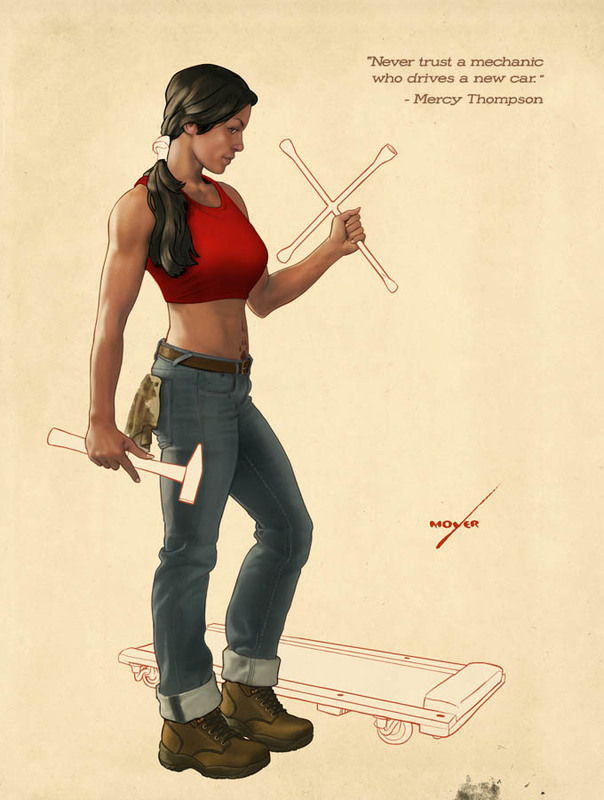 This pin-up of Mercy was inspired by the idea of strength and competence with beauty, brains, and a whole lot of muscle – “a modern ‘Rosie the Riveter'” in Briggs’ words. This is a girl who can take care of herself, and you’d be lucky to have her working on your car. It was a delight to paint her. And moreover to create an old-school garage calendar. Not only matching the format of those classic pieces as best I could, but riffing on the style of Pin-up great George Petty. I grew up never knowing about Petty, but I admired the work of his less-expensive replacement Alberto Vargas. For all his skill, Vargas never surpassed the man he’d been hired to emulate. Petty was so famous in his day that Hollywood made a film called “The Petty Girl”. His style often involved the use of contours painted as vermillion watercolor outlines – even when they overlaid or interacted with a fully-painted figure. The discovery of Petty’s work was one of the reasons I wanted to reconsider the Pin Up, and the satisfaction of those red lines cannot be understated. 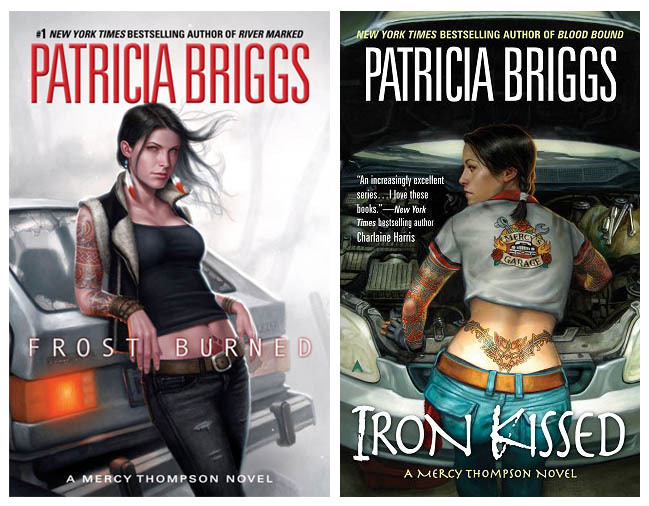 Patricia Briggs’ new book of Mercy’s adventures, “Frost Burned” is coming out in March 2013 with a beautiful new Dan Dos Santos cover. His Mercy cover for “Iron Kissed” is my favorite and in my opinion one of the best covers of the last decade. You can pre-order calendars at The Tinker’s Packs. And stayed tuned for next week’s unveiling of Jim Butcher’s pin-up! I am thrilled to announce the 2013 Literary Pin-up Calendar. This year I again partnered with Worldbuilders to publish my charity calendar, but this time instead of deceased authors who couldn’t fight back, we invited 12 amazing fantasy authors to participate. 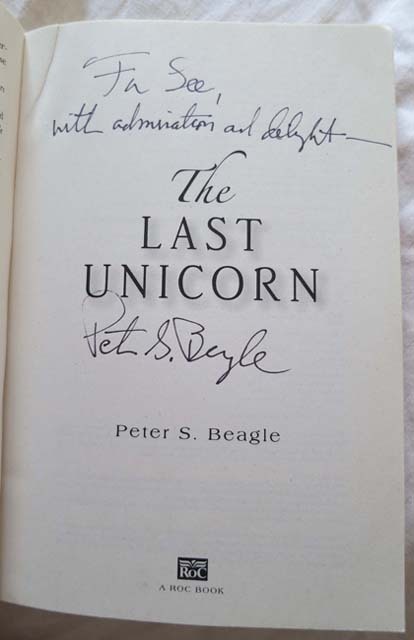 I will be previewing each author, one a week, which leads me to the splendid Peter S. Beagle. I’d love to write all manner of words that might in some way suggest Peter’s own writing. But I can’t. What I can do is tell my brief story and hope that a picture or two will be sufficient keep your interest. I was invited to be the Artist Guest of Honor at Baycon in 2010, and happily accepted. I love getting out and seeing people, talking about art and fantasy and science fiction and the media, and…. the guest of honor was none other than Peter Beagle! There’s a strange integrity to properly told tales, and to their tellers. He and his companion enjoyed the still-unpublished Literary Pin-Ups I had in the art show and I sent them away with one. Two years later, when the calendar premiered at the World fantasy Convention in SanDiego, there was Peter again! I was kicking myself just a little for not bringing anything for him to sign when, by strange twist of fate, someone put a new edition of The Last Unicorn on the Freebies table! When it came time to work on this year’s CHECK THESE OUT! calendar, publisher Pat Rothfuss and I immediately agreed that we wanted Peter included. And, after various calls, notes, and emails with Peter in several different locations about the country: voila. This piece is not representative of the calendar as a whole. It’s not even representative of Peter’s fine multi-faceted career. But it is a picture. And I hope it’s worth at least 1000 words. Calendar pre-order are available on-line at The Tinker’s Packs.